I remember when I was younger going to a restaurant with my dad and ordering the honey pecan crusted salmon. It was one of those dishes you never forget. It was unlike anything I had ever had before. 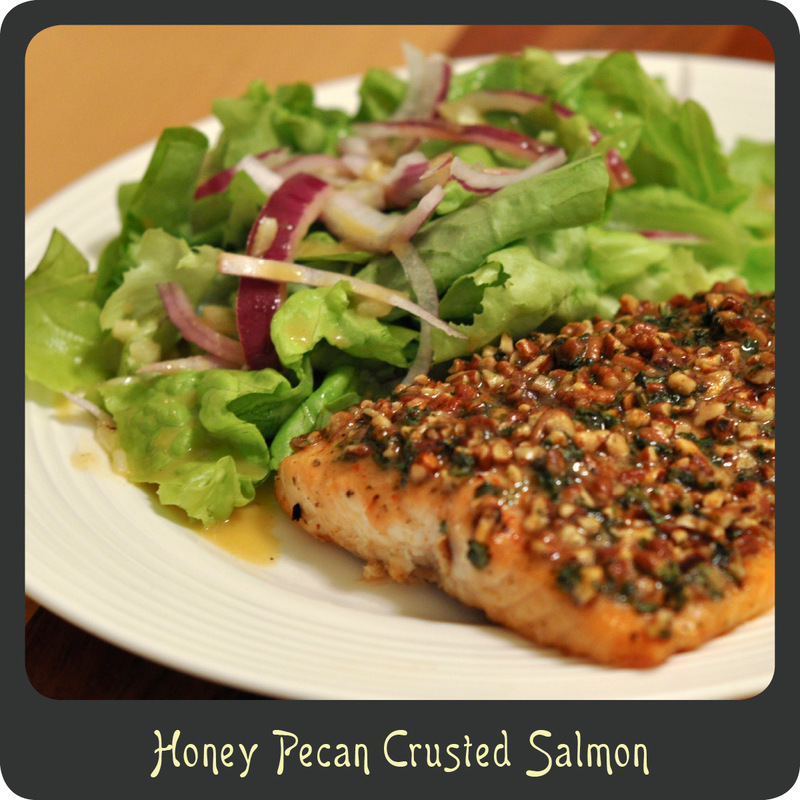 The pecan crust brings a wonderful texture to the salmon filet, just the right amount of crunch. And that nutty pecan flavor with the sweet honey mustard glaze turns the ordinary salmon filet into something truly wonderful. While this dish may look more complex it actually is a really easy way to prepare salmon. Between prep and baking you are looking at no more than 30 minutes. Thirty minutes for a spectacular dinner, you can’t beat that! I served this with a really simple salad of butter leaf lettuce and red onions and some honey mustard dressing. It was really light and the simple salad was a perfect complement to the savory fish. Even if your family members aren’t big fish fans I’m sure they will love this. Rinse off your fish filets and pat dry. Season your filets with salt, pepper, and paprika. Place skin side down on a parchment paper lined baking sheet. Whisk together the mustard, honey, butter, and Worcestershire. In a small bowl combine the pecans and parsley. Spoon a tablespoon worth of the sauce in with the nuts and stir to combine. Brush the remaining sauce onto the salmon filets. Press the sticky pecan mixture to the top of your salmon filets. Place the baking sheet in the oven and cook for 15–18 minutes or until the thickest part of the fish flakes off when tested with a fork. Delicious! This recipe comes an extremely close second to my husband’s favorite way for me to prepare salmon – Barbecued Salmon, from Cooking Light magazine. He has told me before not to bother paying fresh salmon prices unless I make Barbecue Salmon. This recipe received his “acceptance” to make again. LOL Thank you.